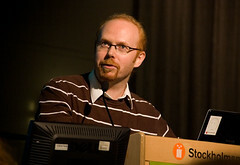 Mattias Davidsson, has a PhD in elementary particle physics from Lund University. He has been working as a high school teacher in Mathematics, Physics and the Scientific Method since 2003. Starting in 2008 he implemented a 1-1 netbook program at his school, documenting the efforts on the blog “Datorn i Skolan – pryl eller verktyg” (The computer in School – Tool or toy? ), which after several years of studying and testing different methods of implementing ICT into teaching, made him part of a now widespread community of ICT-pedagogues, resulting in eg. the first TeachMeet in Sweden. He also writes articles on ICT for Datorn I Utbildningen. Currently, Mattias is working on a project that explores novel ways to teach and learn about physics using simulation tools and gesture-based computer interfaces. Davidsson, M., Johansson, D., Lindwall, K. (2012). Exploring the Use of Augmented Reality to Support Science Education in Secondary Schools. Proceedings of the Seventh IEEE International Conference on Wireless, Mobile, and Ubiquitous Technology in Education WMUTE 2012, Takamatsu, Japan, March 27th-30th 2012.